(Pig Exploitation - Slaughter - 28) Because of the fear caused by "swine flu" in the spring of 2009, Egypt became the only country in the world that decided to slaughter all 300,000 of the pigs, raised in this Muslim country for the Christian minority. The culling was some of the most brutal treatment of "farmed" animals we have ever seen. Pigs and piglets were loaded 5 or 10 a time onto a front loader, that then dumped its cargo into a dump truck with one or two or four layers of previously dumped animals. Suffocating, broken bones, abject terror for all of them. 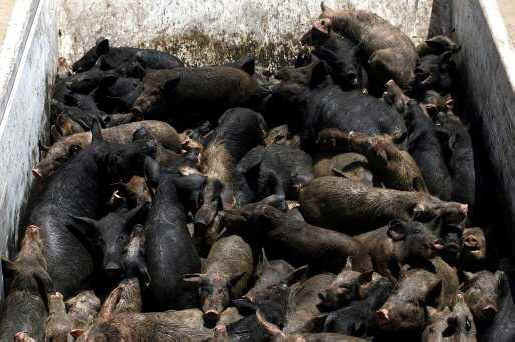 Over and over again until the dump truck was filled to the brim, when the pigs were then transported to mass graves (see Pig-Slaughter-29). Going vegan is the ONLY way for human beings to end these atrocities.